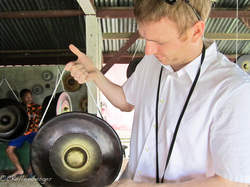 GONGPHORIA performs as one or more percussionists playing one or more symphonic and other type of gongs to achieve soothing harmonic sound effects. By using special tools and techniques of stroking, beating, and rubbing the gongs we create ethereal and powerfully rejuvenating music. The results of the interpretive percussion performance for the audience is hearing and feeling the music's sound waves that are unique, pleasing, and relaxing. The unpredictable sounds produced by the gongs help the brain move smoothly from an active brain wave (Alpha) state to deeper states of relaxation (Theta or Delta). The events where we perform include; free and paid concerts, meditation groups, parties, and private sessions. You can find out where we are playing by clicking on our calendar link. You can book our performances and sessions by clicking on our bookings link. GONGPHORIA musicians are trained gong masters with a lineage of instructors taught by the Grand Gong Master and Teacher, Don Conreaux. We play gong music because we enjoy the sounds and sensations of bringing to life the heart and soul of the gong. It gives us great pleasure to share that same feeling with those we play for. We believe everyone should try a gong concert at least once - because the gong is the ultimate in music relaxation experiences!